Will the reform bill prevent the next crisis? 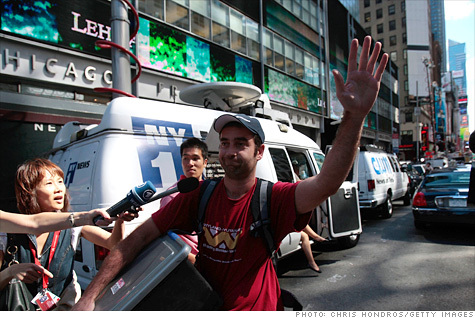 NEW YORK (CNNMoney.com) -- On Sept. 15, 2008, America woke up to its worst financial meltdown in generations. Nearly two years and thousands of pages of legislation later, it is still unclear whether the government has found a way to prevent a similar collapse from happening again. The Senate passed a financial reform bill Thursday with the aim of stopping future crises before they start. The bill addresses several leading causes: crazy lending practices, risky bets by banks, inflated credit ratings on junky assets and an inability to wind down collapsing financial institutions. Will it prevent the next crisis? Even proponents of the legislation concede it might not. The Senate bill -- and a similar House measure -- would do much to make the financial markets safer and fix many of the problems that arose. But it falls short of fundamentally changing the way that financial institutions do business. Here's a closer look at what caused the financial crisis in 2008, and how the financial reform legislation seeks to prevent those problems from recurring. The problem: Wall Street gave mortgages to people who couldn't afford them. Some lenders did not require documentation of borrowers' incomes, and many others simply wrote fraudulent loans. Banks were able to make a fortune off of subprime loans by packaging the risky mortgages and selling them to other banks. Meanwhile, U.S. regulators turned a blind eye to these practices, and government-backed mortgage giants Fannie Mae (FNM, Fortune 500) and Freddie Mac (FRE, Fortune 500) continued to finance the loans. The fix: The bill sets up a Consumer Financial Protection Bureau that would prod lenders to create no-nonsense disclosure forms for mortgage borrowers. So-called "liar loans" would be banned, and lenders would have to document borrowers' incomes and verify their ability to repay the loan. The verdict: Banning the kinds of loans that led to the crisis is a win for both consumers and banks: Borrowers will know what they are signing up for and lenders will be giving less risky loans. But the bill uses incentives to deal with many of the problems, and a number of experts said they wished the legislation went further to force banks to make loans more transparent. The problem: Banks bought problem loans, packaged them with other toxic mortgages and sold them in unregulated markets to other firms. Lax regulation meant that banks did not have to raise enough capital to cover possible losses on the derivatives. When those assets plummeted in value, firms found themselves severely undercapitalized. The fix: The bill forces financial institutions to trade derivatives on regulated exchanges, and they must hold at least 5% of the credit risk on their balance sheets for those securities. It would prevent banks from trading derivatives and introduces stronger capital and liquidity requirements for big financial institutions. The verdict: Increased regulation and stronger capital requirements would likely make derivatives more expensive for financial institutions to buy and harder to conceal their risk, which might make firms think twice about taking on that risk. But some say a loophole that allows some derivatives to continue to trade in unregulated markets will be exploited by Wall Street, and banks can technically still trade derivatives through their parent companies. Critics also say that the legislation does not do enough to force firms to make their risky holdings public. The problem: Credit rating agencies gave top-tier ratings to securities that later proved to be toxic. Underwriters were also able to shop around for the best score, giving credit agencies incentive to inflate their ratings. The fix: The bill would make credit rating agencies disclose the methodology for their ratings, and an independent government panel would match ratings agencies with firms that need their securities rated. The government would also allow ratings agencies to be sued if they are found to ignore independent analysis. The verdict: If banks are not allowed to pick who rates their securities, the credit raters may have less incentive to give an arbitrarily high grade to assets. Lifting legal protections will also make ratings agencies think twice about issuing artificially inflated ratings. But it is unclear what the potential outcomes of the government playing ratings matchmaker would be. The problem: Financial institutions had became so enormous and interconnected that their failure would have caused a catastrophic collapse of the markets. The government, which had no authority to take over investment banks, was forced to let Wall Street giant Lehman Brothers fail. The fix: The reform bill creates a new process for unwinding big financial firms. Also, the Federal Reserve would be able to make emergency loans to banks that are in need of credit but are otherwise healthy. Regulators will be given powers to break up financial companies that have grown too big and threaten to destabilize the financial system. The verdict: The resolution authority in both bills could have led to a much more orderly unwinding of Lehman. But experts say that it is unlikely the government would have the stomach to let a mega-bank fail. Systemic entanglements were the biggest problem with letting Lehman go, as its failure created a crisis of credit that took years and trillions of dollars of federal money to fix.